Welcoming a new baby into your family can be an exciting, but overwhelming experience. They definitely take a toll on your finances! One way to shave off that excess stress is to prepare ahead of time. Try to stock up on the essentials prior to baby's arrival. My advice would be to try not to stock up too much on diapers since that is usually a staple item for baby shower gifts and diaper parties. Wait until after these are done to buy the sizes you think you will need. 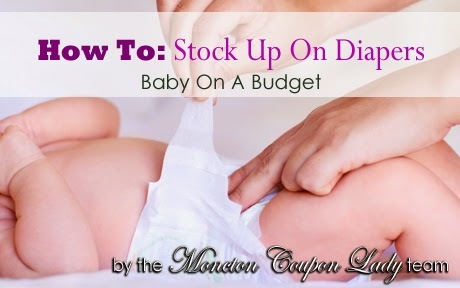 Paying around $0.10/diaper for the smaller sizes and $0.15/diaper for the larger sizes is ideal (using coupons of course!). Definitely keep an eye on clearance bins as diaper packaging changes often, and they will put the “old” ones in these bins. The average size of a baby at birth is 7.5lbs, and the average baby doubles their weight in 6 months, so you shouldn’t need more than a size 2 or 3 for the first few months of your baby’s life. Average 1-year-old is approximately 21lbs. Assumption: you should be able to use Size 3 diapers for the 5 month to 12 month period. Thanks Ashley, for writing this article for our readers!